I hope everyone is looking forward to this coming spring as much as I am, although I haven’t been really waiting. I’ve been outdoors pruning apples over the past two months in a large Hollis NH Orchard. Here’s one of my favorite 8:00 am morning pictures and another to show the density and beauty of an apple orchard. Its amazing to think that year after year in the case of these trees for over 45 years these trees have been producing tons and tons of delicious healthy food. I’ve had a great time in the orchard but Its quickly becoming time to schedule pruning calls for my customers, old and new. If you’re interested in having me prune your fruit trees, plants, and vines please call me at 602-672-7000 or email me to schedule a visit. Hard to go indoors to write this News Update after being happily outdoors pruning over the past two months. For those “Do-it-Yourself” customers, we have something to offer you as well – and its free. If you are planning on pruning yourself and want to learn the finer details of cutting up your fruit trees and grape vines join me here at KSV, 25 King Street, on Saturday, March 25th when one the very best New England fruit specialist, George Hamilton, from UNH Extension Coop. George will be here all day to answer your questions and to show you in person on my personal backyard orchard and backyard Vineyard. The day’s schedule of specific demonstrations is posted right here. 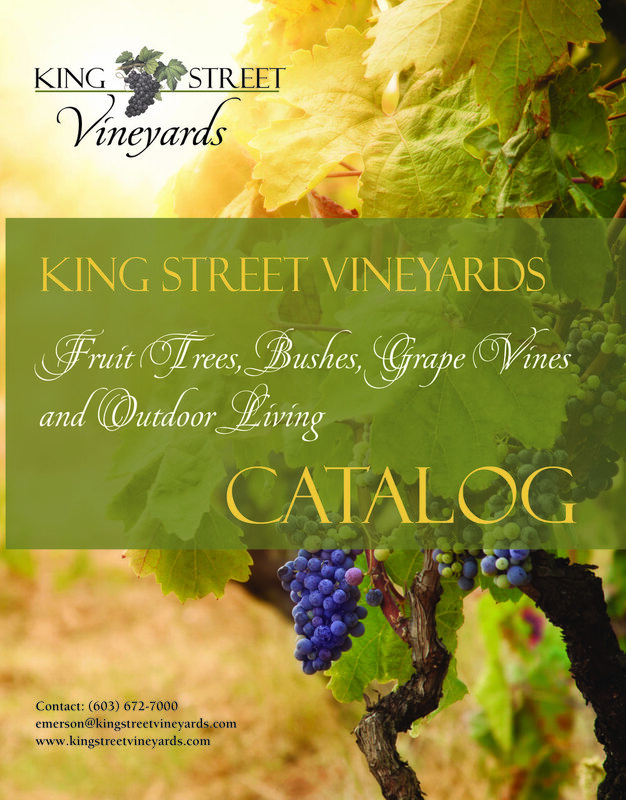 KSV just released its 2017 Fruit Trees, Bushes, Grape Vines and Outdoor Living Catalog. Find it online here to order your fruit trees and plants as soon as you can before we sell out this Spring. By the way it’s free and we’re doing it rain, snow, or shine, below zero or above zero. In other words, we never postpone or cancel these workshops. It’s part of the fun of being a home farmer. Last time the UNH Extension pruned at KSV we were experienced a late March Blizzard. Winter is a great time for your fruit trees to take a break and get a long sleep in order to really produce for you this coming year. Winter can also be absolutely disastrous to an upcoming fruit bearing season I.E. Last year’s very cold periods. The worst of these cold periods is in late winter, early spring when the sun is stronger and lasting longer into each day. The temperature at the base and up the trunk of the tree directly inside of the bark can easily reach into and above the 40’s if nothing is used to counter the sun’s reflection off the snow. The problem is when the sunsets for the evening and temperatures drop into the single digits or further. The damage is done when nutrients from the roots begin their climb up the tree to initiate spring growth and early in their pre-mature journey they freeze. Without getting into detail you can imagine this is probably not good for a healthy harvest of fruit. As you can see in the picture below, I’ve addressed this issue by painting the trunks of my fruit trees white. I used interior latex white paint, the cheapest I could find at a local hardware store. The white paint reflects the sunlight and minimizes any increase in temperature. There’s also another benefit of painting your fruit trees white – it disguises the tree from pests including the borer, vole, and mice who inherits their attraction to fruit trees by the color of the bark. When it’s painted white they typically move on to other trees. This is a picture of what a cherry tree looks like when attacked by a fruit borer. Painting it white reduces the likelihood of it to reoccur. There aren't many fire pit units in the market that is as eloquent a table top as it is a fire pit. You can grill anything on our New England Soapstone. I’m really hopeful and excited about 2017 and what it might mean for the patent pending KSV 4in1 Patio Accessory. I’ve significantly increased the number of manufactured kits which in turn has allowed me to significantly drop the price. I’ll be selling the fire pit frame, the stainless steel pan and sleeve, your choice of colors of inch thick granite tiles, a handsome soapstone grill with grouted hand grips, a beautiful new hard plastic cooler pan with a bottom brass gate valve for easily removing water from the bottom of the pan, and a eloquent powder coated black table top. I’m selling the entire set of four functional patio elements (i.e., fire pit, grill, cooler and coffee table) for under a thousand dollars. That’s almost a 50% drop from last year’s price making it a great buy for a patio accessories in a class by itself. The above is my five year old test fire pit that has been outdoors for the entire time with hundreds of fires filled with nice memories of friends and family and has never once been cleaned or brushed with a stainless steel brush and showing no signs of planned obsolescence. I expect this system will last for many years to come. And when I get a little tired of this particular color, I can easily switch out the granite for a new color. On a personal business goal, my hope is to establish a sales channel of a half dozen (or more) retail outlets around New England who will actively promote and sell the unit. Regardless, I will always promote and sell the units directly from my vineyard. And on a special effects goal I plan building and adding this device to my booth to catch the attention of show attendees at the upcoming March 17-19 Radisson Hotel Manchester, NH. Designed and built for the NH Farm and Forestry Department by Invasive Species Coordinator, Division of Plant Industry, Douglas W. Cygan. It is so incredibly realistic I think it will look awesome inside a KSV 4in1 Fire Pits at the upcoming March 17th-19th NH Home and Garden Show at the Radisson Hotel in Manchester, NH. Come visit me in Booth # 611 in the Ballroom (NOT THE MAIN EXPOSITION ROOM). To get to the Ballroom go into the main lobby of the hotel and pass the Reception area, turn left and you’ll see the entrance to the Ballroom. Hope to see you there. Preparing for an evening of great fun, wine, entertainment and tapas. Come join Vintner and Private Tapas Chef E. Emerson Quigley some Friday or Saturday evening from 7:00-9:00 pm for a very unique experience in beautiful Milford NH. Call 603-672-7000 to make your reservations. We're now offering a Unique weekend experience at KSV for adults. It's a private NH Wine tasting and tapas served by both the KSV Vintner, D. Emerson Quigley who is also serving as your private tapas chef. He will make sure that you leave after having a very memorable special evening out in Milford New Hampshire. You'll be introduced to a number of wines that he has made over the past few years that will surprise you of how good New Hampshire grapes can be for making wine. You will also be served four home-made courses of tapas along with homemade sourdough and artisan breads. The cost is $15 per person and there is no cost for the wine. We only take reservations at least one day in advance. Menus for each of the evenings are posted on the KSV website here. Savoring the benefits of a Backyard Vineyard - KSV Wine and Tapas Tastings every Friday and Saturday evening from 7:00-9:00. Open for private reservations up to 8 mature adults. Immature adults must find something else to do. Please don't hesitate to call (603) 672-700 or email if you have any fruit planting or growing questions. I'm more than happy to help make you a very successful backyard vineyard Vintner or home orchard practitioner.